This weekend past I headed off to Nineworlds wearing two hats: Liz the Fangirl and Liz the New Soon To Be Published Writer. My hotel I stayed in was the Radisson Blu Edwardian at Heathrow and my room was lovely – large and comfortable with a rather splendidly big bed. Also: the aircon was brilliant and I got it blasting cold air into the room as it was quite warm. Events were split between the Ren hotel and the Rad with the book track taking place at the Rad. The staff were all super friendly and generous answering silly questions quite easily. So kudos there. I walked into the Rad and spotted Senny and Marty and Adam Christopher and soon we had a crowd happening and we were chatting about nerves and excitement and concerns. There were so many tracks and I worried that Nineworlds would somewhere fall flat, that they were overreaching but you you know, what? Towards the end of the con, all I’ve heard from everyone is how much fun they had, how it felt inclusive and how like found like. I have yet to be prouder of putting my name behind a convention, I think. Anyway, my first panel was Cake or Death with Paul Cornell, Charlie Stross, me and this incredible ball of energy known as Zen Cho. I basically fell in love with Zen as she is this crazy girl who is funny and charming and honest and well, in my opinion, she stormed the panel. I had fun even though I was scared senseless as it was my first ever panel in front of strangers talking about things, like cake, or death, characters, more cake. It was intense. Macrus Gipps from Gollancz controlled us really well as moderator. A big thanks to him and to Jenny looking after us. My other event on the Friday night was the New Voices readings. ALL THE NERVES. It was late when it came on and I think we all expected maybe four people to turn up. Fortunately there were loads more who did. Those of us who read were: Stephanie Saulter, Adam Christopher, Rochita Loenen-Ruiz, Emma Newman, Barry Nugent, Danie Ware, Jennifer Williams, Lou Morgan, me, Hannah Chutzpah (emcee). 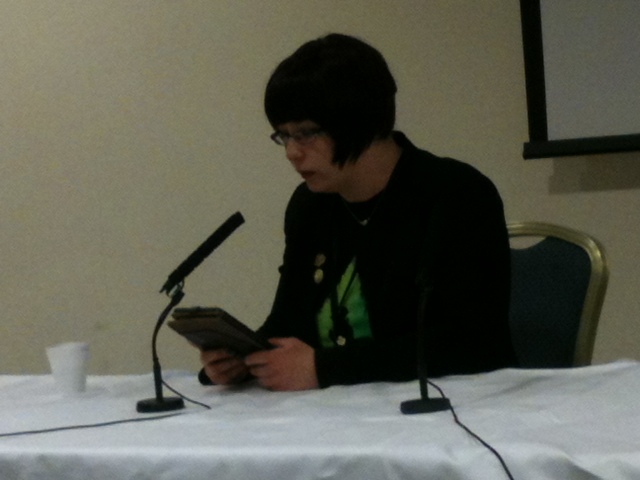 Jen Williams (@sennydreadful) doing her reading on Friday night. The readings went well – there was a lot of nerves to be found but I like to think we managed okay. I mean, none of us passed out OR threw up, so I count it as a win. Saturday morning, after a night of throwing myself around a disco dance floor like a crazy person (ouch), after breakfast I sat in on the HEROES VS. VILLAINS: THE DEBATE! It was FANTASTIC! I laughed myself awake, basically. The debate was handled superbly well by Anne and there was much laughter, much seriousness and much talk about the colour black and also fashion sense. Mark turned up bearing cookies for the registration team and they fawned over him. This made him happy. We sat around for a while chatting to everyone we knew before heading off to more talks and panels until it was time to head off for my next one where I was due to appear on. My next event was with Cory Doctorow, Tom Pollock, Catherine Banner and we were talking about YA. The lovely Laure Eve stepped in to moderate the panel as Amanda Rutter didn’t feel up to it at the time. Laure utterly rocked the session and asked insightful and fun questions. Tom and Cory debated a good few points and I was happy to sit back and let the big boys play. It is a super weird time for me as I’ve been around the YA industry for ages, having read so much, yet I’m only being published next year and with people knowing me as Liz the blogger, I had to wear this Liz the writer hat for a while and it was strange. So thanks to everyone who came up to me to talk to me about my book, about blogging and reading. It really meant a lot a lot, more than you can imagine. On Sunday morning, I checked out, left my bag at the Rad’s conscierge and wandered over to the Ren. I met up with Lou Morgan and we chatted about how much fun we’ve had, what we enjoyed most, what we’d do differently next time round, stuff like that. More people turned up and I ran off to do a quick interview with Max Edwards and he was so sweet asking me questions I actually knew answers to! Then, because I started missing my couch and knowing I had book 2 to tackle and write, I bid everyone adieu and headed home. Nineworlds was a lot of fun. The organisers went out of their way to create an inclusive event with so many strands to it that a great many people were represented. I got chatting to two gender queer folks in the lift at my hotel and they were urging me to come to the talk about disabled folks in gaming and you know, if I wasn’t heading home, I would have. There was so much enthusiasm and so many borders were crossed by so many people who, I think, are sometimes so cautious in real life, because they felt safe at the con. I loved the cosplay peeps too – my giddy aunt. These folks have so much courage, I love it. The dedication and thought that went into the creation of the costumes, I mean, how can you not be in awe? Next year I’ll be clever enough and take a camera along to take pics, that’s for sure. If you want more info about the Nineworlds just past, do check the internet, I’ve seen loads of people tweeting and blogging about it. There’s a huge feeling of community, that’s for sure. 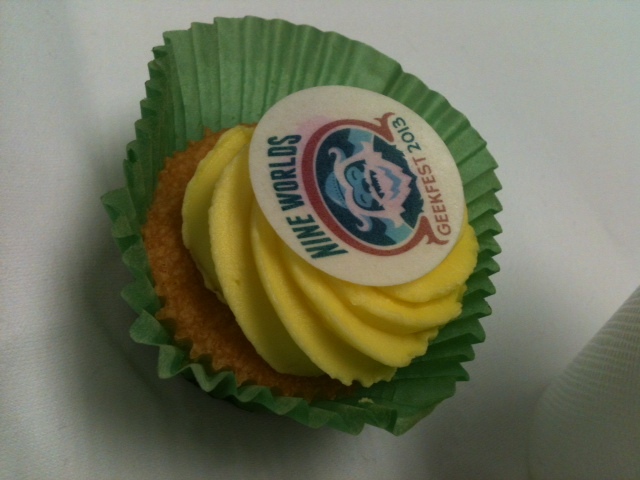 And, come payday, I’ll be booking our tickets for Nineworlds 2014, that’s for sure. Woot! Woot! And all hoots in between! Sounds like you ROCKED it, m’dear. But we all knew that you would. Fabulousness reigns. Put that in your apocalypse bag, baby!